Munsell Publishing Company, Publishers, 1906. THOMPSON, (Hon.) 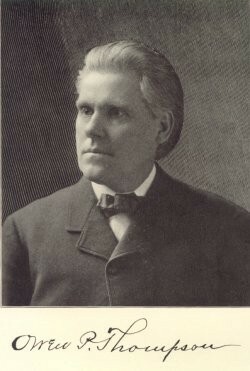 OWEN PIERCE, Judge of the Seventh Judicial District of Illinois, residing at Jacksonville, was born in Bethel, Morgan County, Ill., February 3, 1852, the eighth and youngest child of James B. and Mary (Meguier) Thompson. His father, James B. Thompson, who was one of the early pioneers of Illinois, was born in Hamilton County, Ohio, in 1810, a son of Bernard Thompson, a native of Maryland, who removed to Ohio in the early days of the history of that State, and served through the War of 1812 with the Ohio troops. The grandfather (also named Bernard) enlisted with the Maryland troops attached to the Continental Army, and fought in the Revolutionary War. He was descended from Scotch ancestors, who came to America during colonial days. Various members of the family, in succeeding generations, distinguished themselves in the various walks of American life. Bernard Thompson, the grandfather of Judge Owen P. Thompson, reared a family in Ohio, and spent his life in that State and in Illinois, dying in Morgan County. One of his sons, Andrew Jackson Thompson, removed to Morgan County with the family in 1834, and became conspicuously identified with public affairs in this county, serving as County Judge and as a member of the State Legislature. For several years he lived in retirement at Hotchkiss, Colo. James B. Thompson, Judge Thompson's father, located in Morgan County in 1834. Taking up Government land near Bethel, he developed a farm, tho which, by purchase, he subsequently added. He was a man who was highly esteemed throughout the county by reason of his unimpeachable integrity and his public spirit; and though he never sought nor consented to fill public office, he was always alive to the best interests of his community, which he endeavored to promote in all possible ways. His death occurred in 1897. His wife, who was born near Harrisburg, Pa., died in 1881. Of their family of eight children, two died in infancy, and C. M. Thompson, the eldest son, died in Texas in August, 1901. Those surviving are: Mary, wife of John T. Crawford, of Pueblo, Colo.; Sarah, wife of A. A. McPherson, of McPherson, Kans. ; Elvira, residing in Jacksonville; Dr. P. C. Thompson, of Jacksonville, and Judge Owen P. Thompson. Judge Thompson was reared upon the farm and attended the public schools of the neighborhood. After a course of study in the State Normal School at Normal, Ill., he engaged in teaching, a vocation in which he had been engaged for a portion of the time while still a student. Five years of his life were spent in this work, and the training and discipline thereby received undoubtedly exercised a most potential influence in strengthening the characteristics which have been more or less conspicuous in his mental structure - order, self-control, a rare freedom from prejudice and a continuous desire carefully to analyze all problems which have presented themselves to him before considering their solution. Having decided upon a legal career in his youth, in 1875 he entered the Albany Law School, which was at that time regarded as one of the strongest institutions of its kind in the United States, was graduated therefrom in 1876, and admitted to the bar the same year. Upon the completion of his law course, young Thompson found himself seriously handicapped by a lack of funds, which prevented him from entering at once upon the practice of his profession. In order to obtain the money necessary for the equipment of an office, he taught school for a while, in the meantime looking about for a suitable location. In 1880 he removed to Hiawatha, Kans., where he opened his first office and began practice. A year later he returned to Illinois, and since 1881 has been engaged in practice alone in Jacksonville, with the exception of the years when he has been upon the bench. Always a stanch and unwavering advocate of the principles of the Democracy, in 1886 he was elected County Judge of Morgan County as the nominee of that party, and was reelected in 1890, serving two terms of four years each. Retiring to private practice at the expiration of his second term, he thus remained until his first election to the Circuit bench, in 1897. That his labors upon the bench met the approval of his constituents was evidenced by his reelection in 1903. His term will expire in June, 1909. The district over which he presides includes the counties of Morgan, Sangamon, Macoupin, Greene, Jersey and Scott. Judge Thompson has been closely identified with those projects which have advanced the best interests of Jacksonville and Morgan County along all lines. For some time he has been a member of the Board of Trustees of Illinois College and of Illinois Woman's College, and during the administration of Governor Altgeld, from 1892 to 1896, served as a Trustee of the Illinois Central Hospital for the Insane. Since 1873 he has been a Mason, and is now a member of Jacksonville Lodge, No. 570, A.F. & A.M., and of Hospitaler Commandery No. 31, K.T. He is also a charter member of Jacksonville Lodge, No. 152, Knights of Pythias, of Duncan Camp, No. 152, M.W.A., and of Jacksonville Lodge, No. 682, B.P.O.E. He was united in marriage May 31, 1883, with Elizabeth Ruddick, a native of Jackson County, Ind., and a daughter of Solomon Ruddick. They are the parents of three children, namely: Mary, Perry Paul and Irene. Personally, Judge Thompson is highly regarded by the citizens of Morgan County, many of whom have watched with interest his career from the days of its earliest struggles for recognition at the bar. The sterling traits of character which were so conspicuous in his rugged Scotch ancestry manifest themselves in his personal characteristics - sometimes to a marked degree - and the traditions of the race probably should receive no inconsiderable share of recognition in an analysis of the foundation of his strength among his fellow-men. Self-made in every sense of the term, he has become widely known as an upright, conscientious, public spirited citizen and man of affairs, a wise counselor and just Judge; and the record of his life entitles him to a place in the historical literature of Illinois.